In February, Charter announced that it would be adding itself to the live TV streaming Spectrum. The service would be called “Spectrum TV Essentials” and promised to launch by “the end of March,” according to Charter’s press release. It looks like they’ve been true to their word, as Cord Cutters News reports that Spectrum has begun rolling the service out in select markets. It’s only available to Spectrum Internet customers, costs $15 a month, and includes more than 60 channels and all of their associated on-demand libraries. 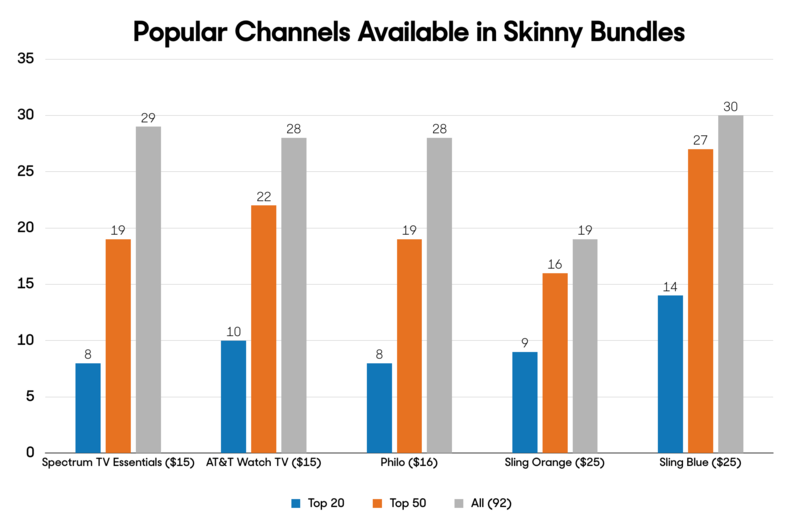 Here’s how it stacks up to other skinny bundles. The reason Spectrum TV Essentials and other skinny bundles are so much cheaper than other live streaming services is that they cut out all the channels that have the highest distribution fees — namely, the stuff that must be viewed live, like sports, news, and awards shows. Spectrum TV Essentials’s closest competitors are Philo ($16/month) and AT&T’s named-by-an-SEO-bot WatchTV ($15). Spectrum has more total channels — 62 to Philo’s 44 and WatchTV’s 42 — but there are a lot of diminishing returns in there, with five different versions of MTV, four BETs, and four Nicks. What’s more, unlike Spectrum TV Essentials, AT&T’s Watch TV is available to anyone; you don’t need an AT&T Internet plan to subscribe. While it’s only available to Spectrum Internet customers in select markets right now, Spectrum TV Essentials is a solid deal if you don’t want to pay extra for sports and local channels. It has virtually the same channel lineup as Philo, but it is a dollar cheaper per month. AT&T’s Watch TV has more in-demand channels for the same price, but if The Weather Channel, Paramount, Travel Channel, Nick Jr., and CMT are important to you, go with Spectrum.